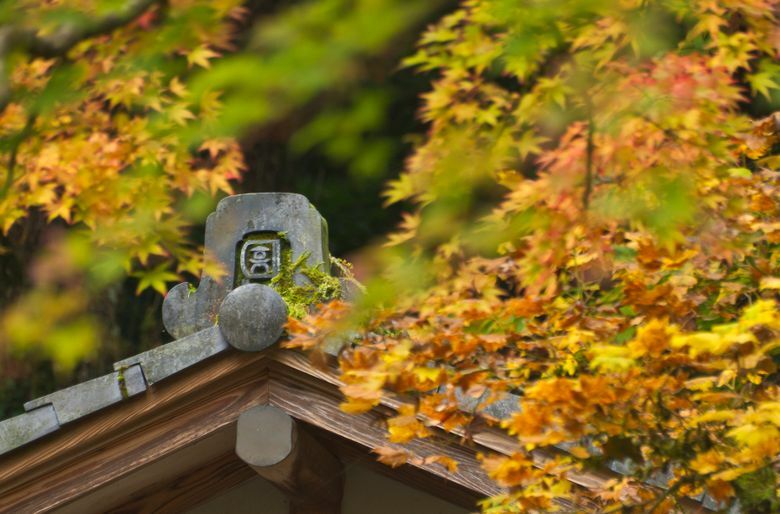 Beyond October's splendid hues, explore the new Cultural Village, Castle Wall and Umami Cafe. 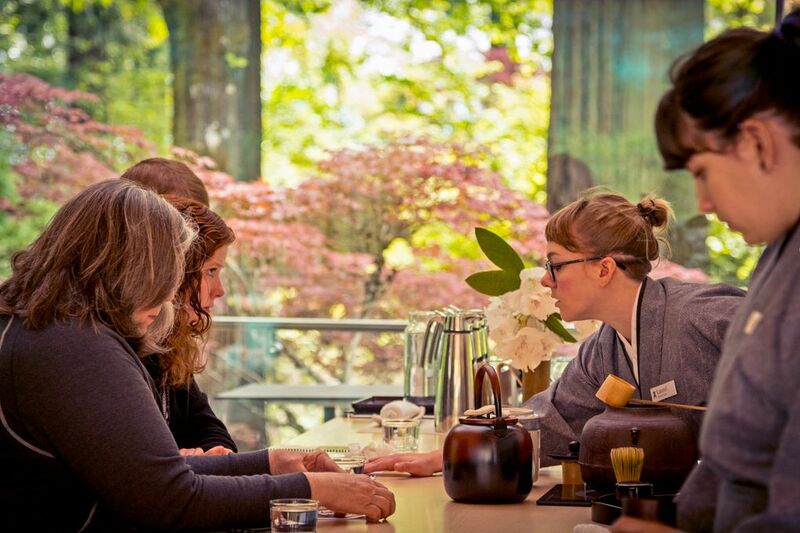 PORTLAND — In a year when big changes have taken root at the highly acclaimed Portland Japanese Garden, I found myself standing stock still a few steps inside the garden’s Nezu Gate, looking and listening, silent and unmoving. Everything here has a tranquility-inspiring meaning, nothing is accidental, instructed my kimono-jacket-wearing tour guide, Peter Shinbach, nodding to pines whose branches had been pruned to look like clouds floating by. But there’s more than what meets the eye. He cocked an ear at the soft tinkling of water spouting from a length of hollow bamboo onto a mossy rock in front of us. It soothed like a cool, wet cloth on the back of my neck. If you’d been here decades earlier, the water’s music might have been overpowered by the shrieks of monkeys that once occupied a nearby grotto, part of the neighboring Oregon Zoo. 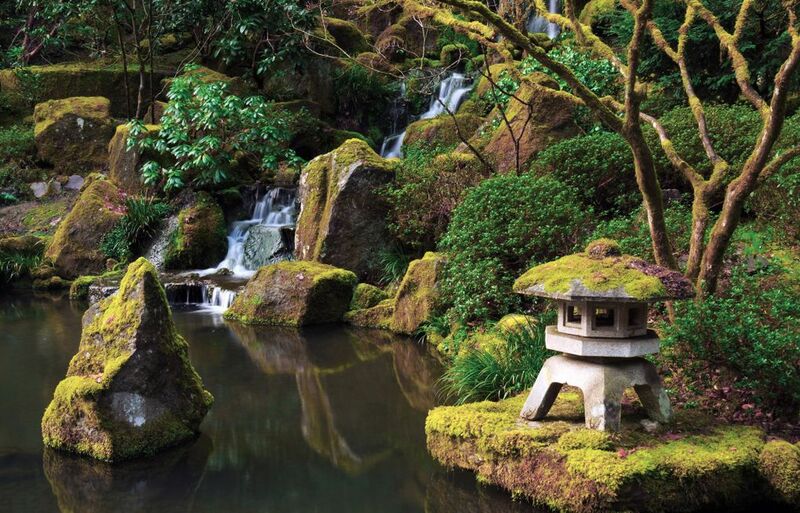 But the monkeys and the zoo moved farther uphill in Portland’s Washington Park, and the Portland Japanese Garden, which opened to the public 50 years ago, is today regarded as perhaps the most authentic such garden outside of Japan. That status advanced with last spring’s opening of the garden’s new $33.5 million Cultural Village, designed by renowned architect Kengo Kuma, who is also spearheading the National Stadium for the 2020 Tokyo Olympics. 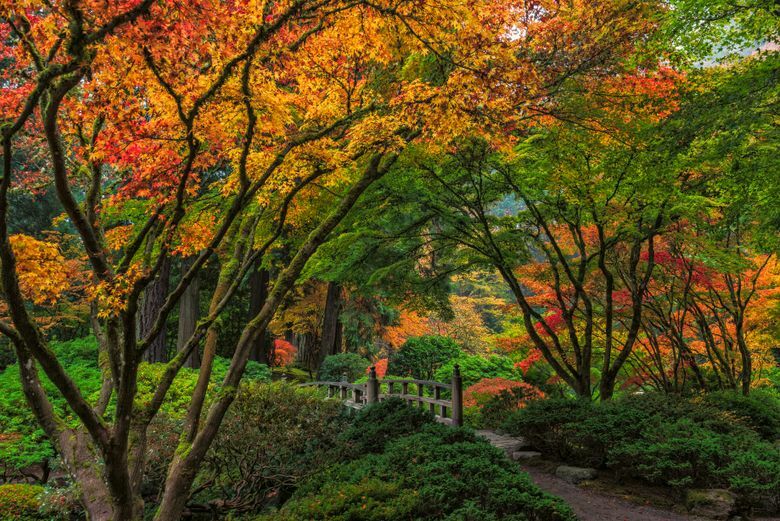 Autumn, when the garden’s Japanese maples turn fiery shades, reflecting in ponds and contrasting with native evergreens, is perhaps the most jaw-dropping time to visit and see what’s new. The “village” has added 3.4 acres of usable space to the 9.1-acre property. 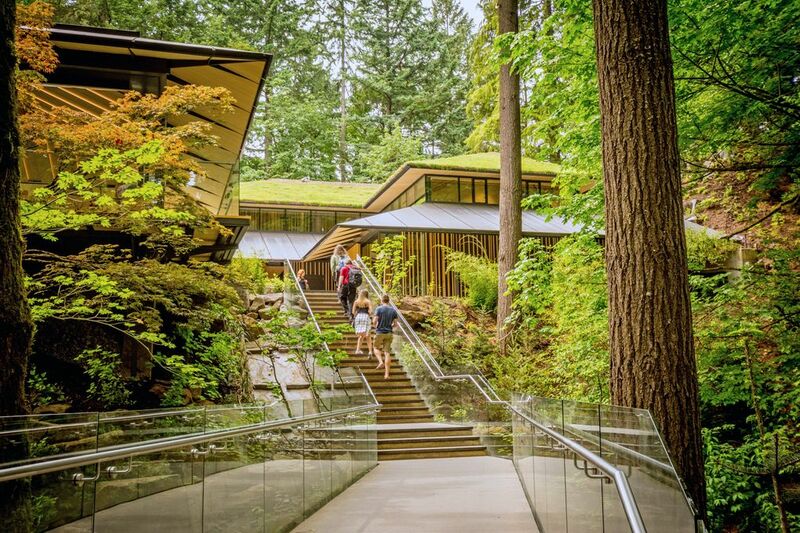 Included is a new Japanese Arts Learning Center with gallery space, a classroom, library and gift shop; a Garden House, for horticulture workshops, along with a bonsai terrace and the striking new Umami Café. The cafe’s cantilevered deck is designed to “float” over the garden’s shady entry canyon where visitors wind their way on a peaceful trail upward from the outside world of parking lots and pay stations. Take a seat and sample Japanese tastes such as onigiri, savory balls of sticky rice wrapped in seaweed. A remodeled entrance features a water garden with cascading ponds, aiding in the transition from city to tranquility. 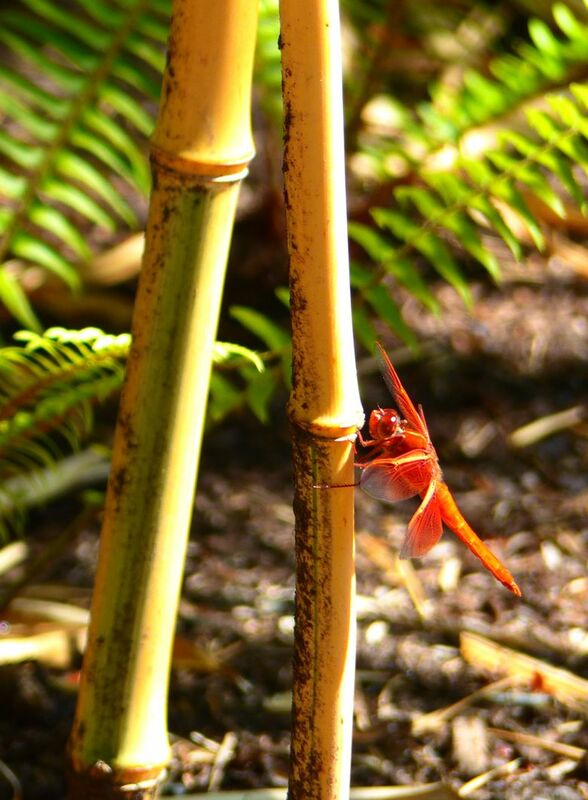 As I waited to buy tickets, an orange dragonfly the size of a small hummingbird paused to perch on a bamboo stalk near my feet. To protect the peaceful environment, the village emulates Japan’s monzenmachi, the gate-front towns that surround sacred shrines and temples. Among the more novel new features is the authentic, medieval-style Castle Wall backing the village. 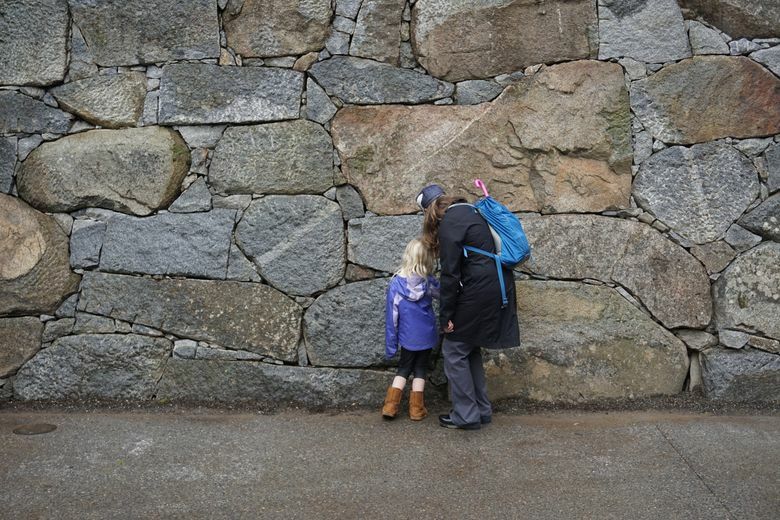 A 15th-generation Japanese master stonemason, Suminori Awata, led construction of the 18½ foot high, 185-foot-long mortar-free wall using traditional hand tools and 800 tons of Oregon granite. It has some of the same awe-inspiring power of an Egyptian pyramid. The beloved core garden remains unchanged, with examples of five different styles of Japanese garden, showing their evolution through the centuries. 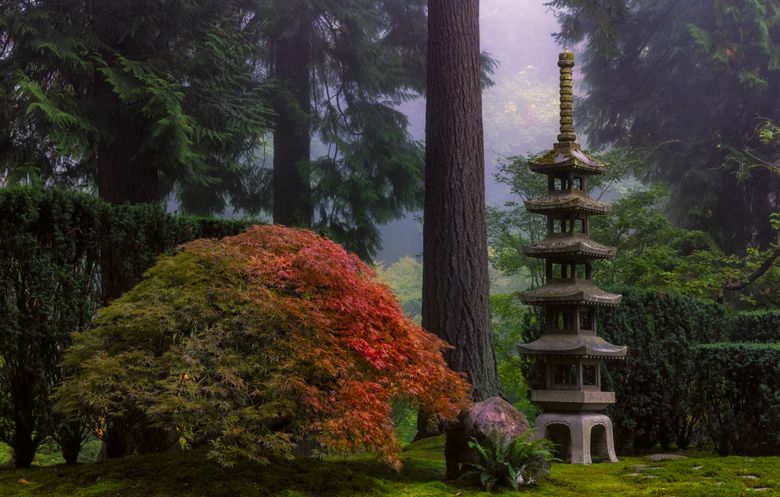 For example, he pointed out a wisteria arbor framing a view of a pagoda lantern tower and cedars. A guide serves to add context and meaning to a garden visit. As we walked along a smoothly raked path, it changed to rough stones “like a speed bump to slow you down” and make you look more closely at a scene ahead, Shinbach explained. Japanese gardens have an ancient history influenced by Shinto, Buddhist and Taoist philosophies and there is symbolism wherever you look. A lotus bud atop a pagoda lantern is a reminder of the belief that where Buddha stepped a lotus flower bloomed. As we passed an arrangement of stones in the ground, our guide noted that they were in the shape of the Japanese island of Hokkaido. I’d have just seen rocks. He explained that the “hide and reveal” technique is commonly used in Japanese gardens, thus we could hear but not see a waterfall for an extensive part of our walk. The path then disappeared into woods, and who knew where it led? There’s a sense of calm, all right, spiked with a tiny frisson of adventure. • The Strolling Pond Garden includes upper and lower ponds connected by a flowing stream. The upper pond features an iconic, arching Moon Bridge — a concept borrowed from China — and the lower pond, fed by that elusive waterfall, has a Zig-Zag Bridge weaving above beds of water iris and a teeming school of fat koi (a hit with kids). • The Natural Garden is a style popularized in the 1920s after a devastating earthquake struck the Tokyo region, killing 140,000 people. “They looked for a style with stability and sturdiness in their lives,” Shinbach told us. There are no shaped trees, no fragile lanterns, but many solid shrubs. 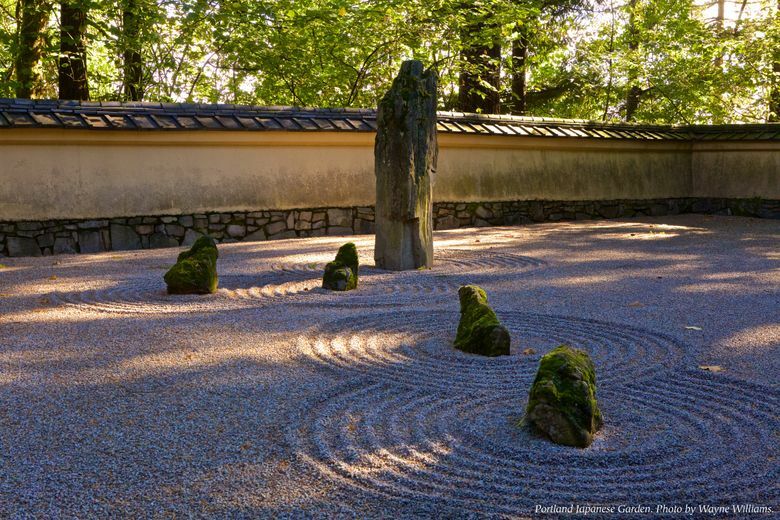 • Dating to about the 13th century, the style known as the Sand and Stone Garden features an important Japanese aesthetic principle, yohaku-no-bi, meaning “the beauty of blank space.” A wide field of fine gravel is raked into swirling patterns like sea waves surrounding islands of stone. • The Flat Garden, another field of raked gravel and island stones, showcases the beauty of each season. It’s ringed by azaleas and a weeping cherry tree for spring blossoms and a laceleaf Japanese maple, more than a century old, for vibrant autumn color. Visit this fall to take it all in. 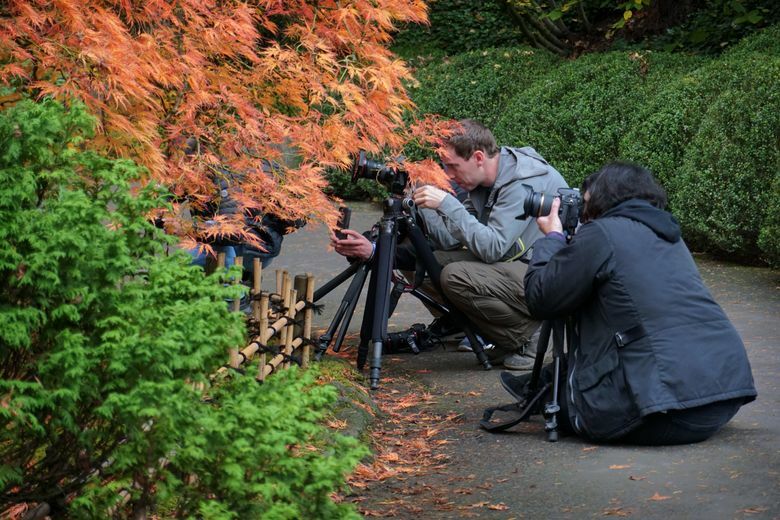 Feel the tranquility, savor the silence, photograph the dazzling foliage. And then if you need some noise and excitement back in your life, there are monkeys just up the hill. 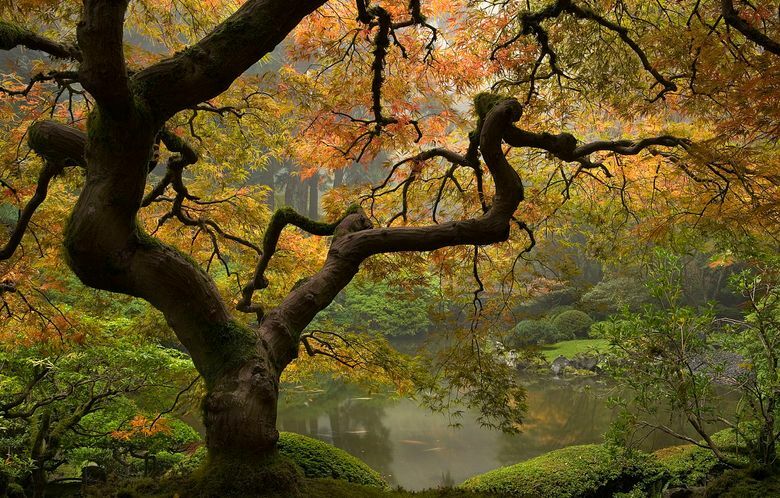 Portland Japanese Garden, 611 S.W. Kingston Ave., is in Washington Park, across the street from the International Rose Test Garden. Parking is limited. The garden is served by TriMet bus 63, which connects to MAX light-rail stations at the Oregon Zoo and Providence Park. • Through Sept. 30: Monday, noon-7 p.m.; Tuesday-Sunday, 10 a.m.-7 p.m.
• Oct. 1 to mid-March: Monday, noon-4 p.m.; Tuesday-Sunday, 10 a.m.-4 p.m. One-hour volunteer-guided tours included with admission. Tour times subject to volunteer availability, but are generally at noon March-October and on weekends only at noon in November-February. To verify tour times, call 503-223-1321 the day of your visit. Because of its microclimate, the garden’s fall colors typically do not peak until a few weeks after other Portland trees, typically mid- to late October. Call ahead to check. Every Sunday, 1-2 p.m. (and frequently at other times), take in a cultural demonstration in the garden’s Japanese Arts Learning Center. Regular demonstrations include koto (Japanese harp) playing, wearing of the yukata (Japanese kimono) and chado (the Way of Tea). 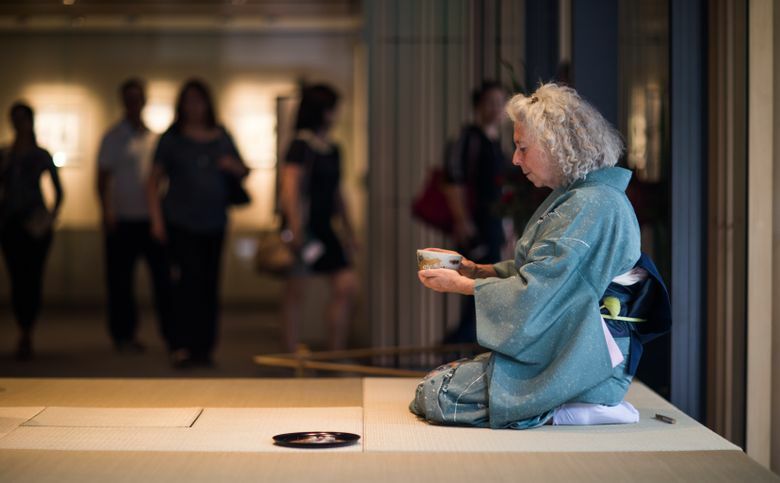 Free public tea demonstrations are every Saturday, 1-2 p.m., in the Cathy Rudd Cultural Corner. With a cup of sake or tea in hand, watch from the garden’s eastern overlook as the full harvest moon rises over Portland. Stroll through the lantern-lit garden and observe a quiet tea ceremony in the Kashintei Tea House. 6-9 p.m. Oct. 4-6, $45. “Mirrors of the Mind: The Noh Masks of Ohtsuki Kokun” features 30 hand-carved Noh masks and eight elegant brocade costumes from the traditional silk looms of Orinasu-kan in Kyoto. Oct. 14-Dec. 3 in the Cultural Village gallery; included in garden admission.